This article provides in-depth fundamental analysis of Indo Count Industries Ltd, an Indian textile player, which has a significant share in the home textile segment of USA and has marquee clients like Walmart, JC Penney, Target, etc. as customers. I have been a regular reader of your blog and based on your template I have done an analysis of Indo Count Industries Ltd.
We can see sales growth for Indo Count Industries Ltd is around 26% in last 10 years. Also, we can see that OPM and NPM are increased almost from negative to respectable OPM (6% to 20%) and NPM (3 to 12%). 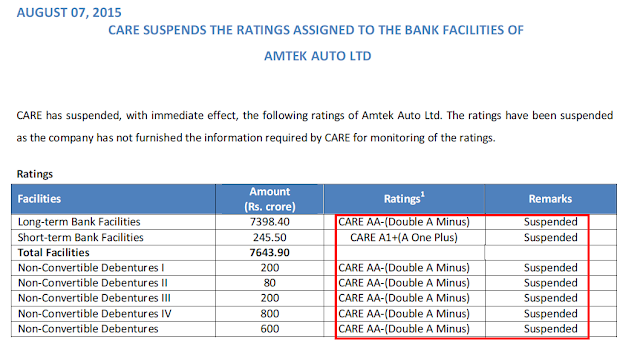 The current ratio is around 2.07 which is more than 1 and company is able to take care of current liabilities. The company has successfully converted from negative cash flow to 204cr in 2016 in last 10 year and using it for capital expenditure and paying the debt. If we compare the cumulative PAT and CFO for last 10 years (2007-16), we realize that company has collected cash more than its profits. It indicates that the company is able to collect its profits in cash and it is not stuck in receivables & inventory. 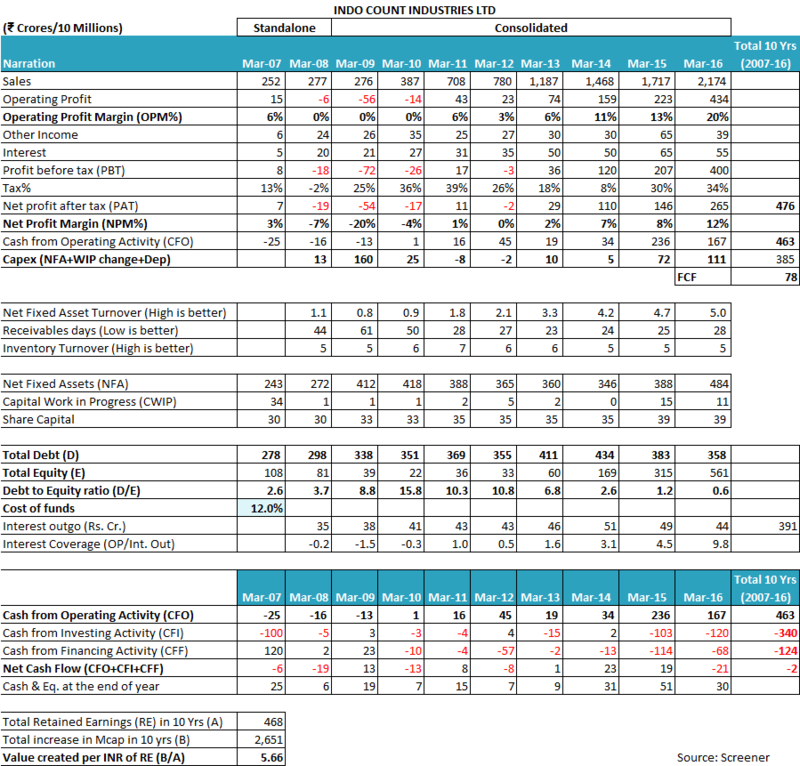 After analysis of financials, Indo Count Industries Ltd for last 10 year we can clearly see the loss-making company is all set for profits by reducing debt and improving sales, OPM and NPM. 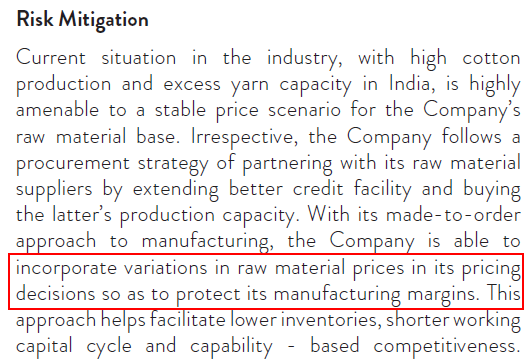 For last 10 years, it has sales growth of 26.10%, NPM% 48.41% and D/E is 0.52 which is best compare to peers Vardhman Textile, SRF, Grasim, Arvind Ltd.
cCFO=534cr and cPAT=448cr shows that the profits of Indo Count Industries Ltd are flowing to the company as cash. Profits are not being stuck in the receivables and inventory. This is a good sign. Indo Count Industries Ltd is in the phase of moving from loss to profit making and offer some of the MoS and another parameter if we wait and grab it at good levels. I was not able to understand other parameters from the annual report. The company was in profit so I can see a hike in Promoters salary. But commission for CEO is quite high. Many thanks for sharing your analysis of Indo Count Industries Ltd with the readers and the author. I appreciate the time & effort put in by you in the analysis. Let us analyze the financial performance of Indo Count Industries Ltd over last 10 years. 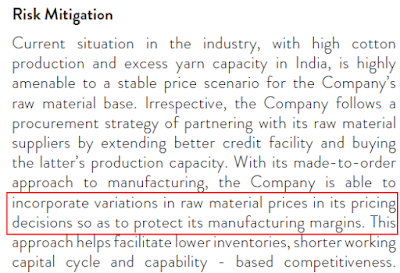 It seems that Indo Count Industries Ltd has been preparing only standalone financial statements until FY2008. However, from FY2009 onward, it has been publishing consolidated financials as well. It is preferable that while analyzing any company, the investor should take a view about the entire entity including its subsidiaries, if any, so that she is aware of the complete financial and business performance picture of the company. Therefore, while analyzing the performance of last 10 years for Indo Count Industries Ltd, we have analyzed standalone financial performance until FY2008 and consolidated financial performance from FY2009 onward. The company has made operating level losses until FY2010. However, since FY2012, the operating profitability of the company picked up and has been on the improvement path ever since. The operating profit margins have improved from 3% in FY2012 to 20% in FY2016. The company has been going through very rough phase during FY2008-10. The global financial slowdown along with some specific decisions of the company worked against it and resulted in the company facing deep losses. One of the decisions of Indo Count Industries Ltd, which hurt it bad was the decision to enter into a derivative contract that led to losses of ₹150 cr and pushed the company into corporate debt restructuring (CDR). However, the company pulled its act together and improved its business performance going ahead. The company started reporting operating profits from FY2011 and later on improved its margins. Subsequently, the company paid its bankers for the loss of income that they had on account of restricting (recompense) and successfully came out of the restructuring in April 2014, four years ahead of the projected exit. This is very good performance shown by Indo Count Industries Ltd. However, it remains to be seen whether the company would be able to sustain such operating margins. In the annual report for FY2016, the management has communicated to shareholders as part of its management discussion & analysis section (pg. 59), that the company has the ability to pass on variations in raw material to its customers. Over the years, the tax payout ratio of Indo Count Industries Ltd has been fluctuating on account of accumulated losses as well as the various incentives. However, since FY2015, the tax payout ratio has stabilized, which is near the standard corporate tax rate in India. Operating efficiency parameters of Indo Count Industries Ltd reflect that it has been able to improve its net fixed assets turnover (NFAT) over the years. NFAT has improved from 0.8 in FY2009 to 5.0 in FY2016. This is a very significant improvement by the company in terms of asset utilization. 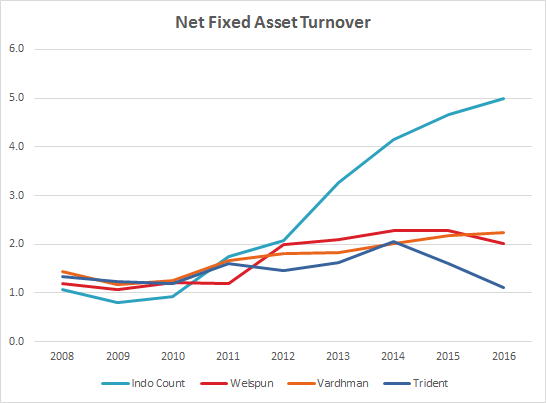 Indo Count Industries Ltd has improved its asset turnover remarkably over the last decade from being the lowest to the highest among its peers. This is a good performance and the company deserves a pat on its back for such performance. The outsourcing of yarn production seems to have led to significant improvement in the asset turnover of the company. Over the years, Indo Count Industries Ltd has been able to maintain its Inventory turnover ratio (ITR) at a stable level of about 5-7 times. Indo Count Industries Ltd has improved its receivables days significantly from 61 days in FY2008 to 23 days in FY2013. However, recently, an investor would notice that the receivables days has been going up slowly and has risen to 28 days in FY2016. An investor should keep a close look at the receivables days of the company and analyze any deterioration in depth. While analyzing the receivables position of the company at March 31, 2016, the investor would notice that at a consolidated level the outstanding receivables are ₹206 cr (AR FY2016, pg. 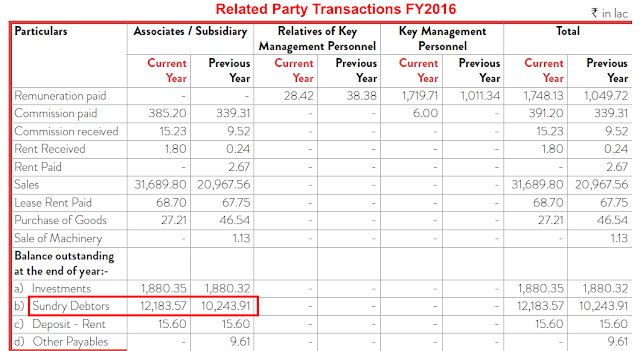 116) whereas at the standalone level, the outstanding receivables are ₹289 cr (AR FY2016, pg. 84). It means that about ₹83 cr worth of funds have been collected by subsidiaries of the company but has not been remitted to the company. 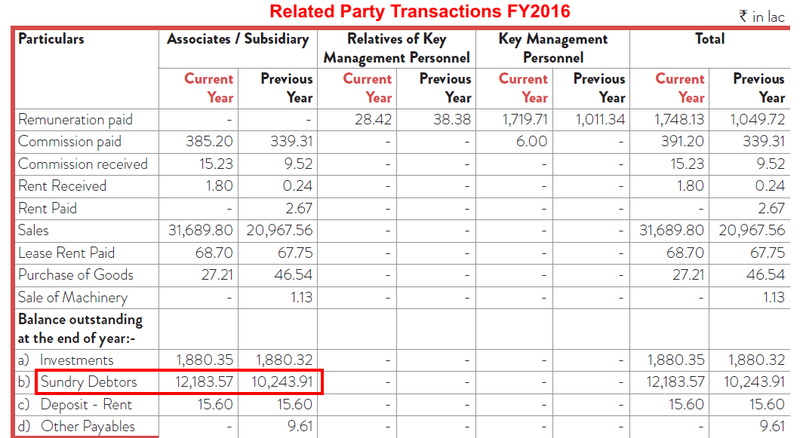 While analyzing the related party transactions section of the FY2016 annual report (pg. 106), the investor would notice that Indo Count Industries Ltd has outstanding receivables of about ₹122 cr from its subsidiaries. The key subsidiary among these is Indo Count Global Inc. (USA). It might indicate that the company is receiving money from its customers in the USA, however, the wholly owned subsidiary in the USA is not remitting the funds to India. An investor should monitor the comparative receivables position closely and understand whether the company has any CapEx plans for the USA, which might be leading it to hold funds overseas. Otherwise, keeping cash overseas, which would be earning very low returns on deposits when compared to India, might not be a very good decision. The sustained holding of cash overseas without utilization can also be a sign of caution, which might require the investor to do an in-depth assessment by the investor. When we analyze the cumulative profits and cash flow data for 10 years (FY2007-16)), then we realize that Indo Count Industries Ltd has been nearly able to convert its profits into cash flow from operations. Cumulative PAT during FY2007-16 is ₹476 cr. whereas the cumulative cash flow from operations (CFO) over the similar period has been ₹463 cr. Over last 10 years (FY2007-16), Indo Count Industries Ltd has done a capital expenditure (CAPEX) of ₹385 cr. Due to the capital intensive business model in the initial part of last 10 years and the losses, the company has relied heavily on debt to meet its funds requirements. The resulting heavy interest burden of the debt resulted in the debt levels rising from ₹278 cr in FY2007 to ₹434 cr in FY2014 despite the company staying away from any major CapEx during FY2010-14. However, as mentioned above, during last two year FY2015-FY2016, the company has witnessed significant improvement in profitability and as a result, Indo Count Industries Ltd has been able to reduce its debt from ₹434 cr in FY2014 to ₹358 cr in FY2016 in spite of doing CapEx of about ₹180 cr in the last 2 years. This performance of Indo Count Industries Ltd has been recognized by the credit rating agencies as well. As a result, the credit rating agency CARE Ltd has upgraded its credit rating twice in the current financial year by total 6 steps/notches from BBB- to A (4 steps) in April 2016 and then from A to AA- (2 steps) in Oct. 2016. 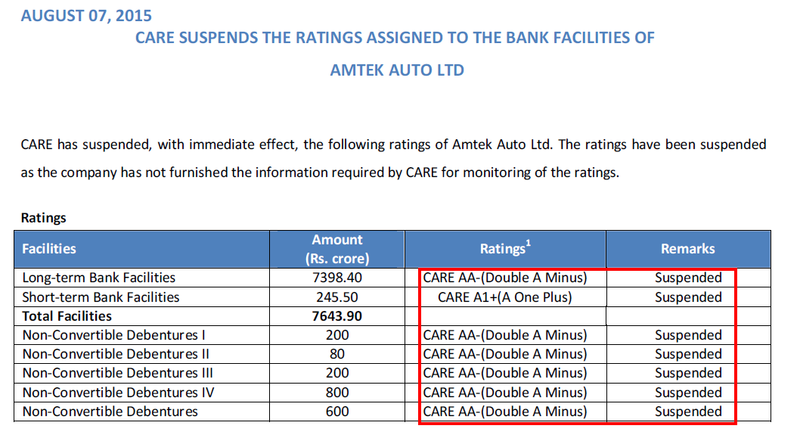 This is an exceptional upgradation in credit rating of a company by any credit rating agency and the level of upgrading should be taken with a pinch of salt by the investors as it was the same credit rating agency, CARE Ltd, which had suddenly suspended its credit rating of Amtek Auto Ltd in August 2016 directly from AA- when Amtek Auto Ltd could not repay its lenders despite being rated AA-, which is a very strong credit rating. Nevertheless, the upgradation of the credit rating reflects the improving business & financial position of Indo Count Industries Ltd, which we have observed in our above analysis. The company is currently doing a major capex of ₹175 cr in phase 1, which it expects to complete in the current quarter and plans to do another CapEx of about ₹300 cr in phase 2. These CapEx plans along with the customer contracts helping it to maintain operating profitability margins might present an attractive combination of profitable growth for the company. However, an investor should monitor the execution performance of the company closely lest delays in completion lead to the cost overruns in the projects and as a result, the company might lose out on the promises made to customers. Such a situation might lead to the company again lead the investors to face the tough times, which the company faced in the past. Nevertheless, using the funds generated from operations to do CAPEX and simultaneously reducing debt is a good sign and the markets have rewarded Indo Count Industries Ltd handsomely. Over last 5 years, the share price (post adjusting for 1:5 split reducing the face value from ₹10 to ₹2, effective from current month) has increased from about ₹1.86 (November 31, 2011) to ₹142.65 (November 25, 2016), which is a handsome 7500% return in last 5 years. Indo Count Industries Ltd approved the allotment of 28,98,300 warrants to promoters in the meeting on September 11, 2013, at a price of ₹17.25 per share (pre-split price, the post-split equivalent price would be 1/5 of it: i.e. ₹3.45 and the number of shares post-split would be 5 times: i.e. 1,44,91,500). The warrants are allotted by companies based on a formula, which is based on the share price levels of past 6 months and are allotted by taking 25% of the value at warrants allotment. The balance 75% of the money is collected when the warrant holder converts them into equity shares. An investor would notice that warrants are like call options where the holder has paid a premium of 25% of the value and would convert the warrants into equity shares by paying balance 75% only at the time of conversion the price of the equity share of the company is higher than the warrant allotment price. Warrants are usually convertible within 18 months from the allotment. An investor would notice that the warrants holder (promoter in this case) has got a right to subscribe to the company shares and increase her stake in the company at a predetermined price without worrying about the usual share price increase which happens if the promoters buy shares of their company from the open market. In case the share price does not increase, then the promoter simply lets the warrants expire. That’s even though the companies say that warrants are issued to the promoters in lieu of the capital infusion by them at times when the company needed funds. However, I call warrants a legal instrument in the hands of promoters/allottees to speculate on their company share price. And invariably, the persons to bear the cost of such speculation are the minority shareholders. An investor would see that the promoters infused ₹1.25 cr for allotment of warrants in FY2014. Looking at the financials of the company in FY2014: Sales of about ₹1,468 cr, net profit of ₹110 cr, debt of ₹434 cr and interest expense of ₹50 cr, the infusion of ₹1.25 cr by promoters seems insignificant in terms of overall financial position of the company and that too by calling a special extraordinary general meeting.If it was urgent, then Indo Count Industries Ltd could have collected this much amount by making a single phone call to any of their customers so that they may pay ₹1.25 cr from the outstanding trade receivables of ₹127 cr on March 31, 2013, and ₹167 cr at March 31, 2014. Such collection in the time of urgency would not have been difficult from long-standing customer relationships. Moreover, even if the company needed funds, the promoters did not infuse the balance 75% of the warrants funds i.e. ₹3.73 cr (1.44 cr. Shares * ₹3.45 * 75%), until December 20, 2014, which is good 15 months post allotment. If the warrants were allotted supposedly for the urgent requirement of funds by the company, then the balance 75% funds infusion would have come much sooner. However, even the balance 75% (₹3.73 cr) seems insignificant in terms of overall finance requirement of Indo Count Industries Ltd. Moreover, the conversion of warrants allowed the promoters to increase their stake in the company by 3.20%. Further, there is a peculiar observation related to the timing of conversion of warrants into equity shares in December 2014. As per our analysis above, we have observed that from FY2014, the performance of the company had started improving a lot and as a result, the company came out of the corporate debt restructuring (CDR) in March 2015, which is just 3 months after the promoters converted their warrants into equity shares. 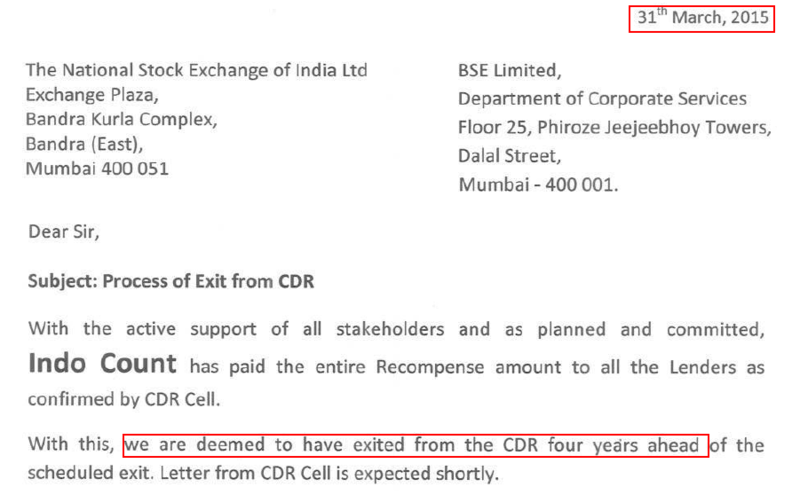 No wonder, the promoters converted their warrants in December 2014, as they know the best out of all the people, about the financial position of the company at any point of time and that the company would be exiting the CDR very soon. As is normally expected with a company showing improving business performance, after the exit from CDR, the share of Indo Count Industries Ltd raced ahead and touched the lifetime high of ₹249.69 on February 8, 2016, valuing the 1.44 cr shares (post-split) converted by promoters from warrants at ₹360 cr. It must be remembered that promoters got these shares by getting the warrant allotment at ₹4.97 cr. (1.44 cr share * ₹3.45 post-split allotment price). Assets held by companies, just like the assets held by us, keep on changing in valuation over the years e.g. during growing times certain assets like land increase in value and the company is right in reassessing the value of such assets and changing their value in the balance sheet. The original value of these assets in the balance sheet is the acquisition cost, which can now be increased/decreased to reflect the current value so that the balance sheet and book value can be closer to real valuations. However, what is surprising in the revaluation done by Indo Count Industries Ltd is that they have revalued assets like building, plant & machinery, diesel generator (DG) sets as well and valued them at a higher valuation than acquisition cost despite using them for their operation for some time. The company may have its reasons to believe that building, plant & machinery and diesel generator sets may also increase in value over usage & time. However, by common logic, it seems more probable that value of diesel generator sets, plant & machinery and building goes down due to usage related wear & tear. Therefore, an investor should analyze further to understand the peculiar nature of mentioned diesel generator sets, plant & machinery and the building that they are increasing in value with usage over time. By analyzing the FY2010 annual report, the investor would notice that the company has revalued its above-mentioned assets by about ₹178.7 cr. The investor would appreciate the importance of analysis of the extent of revaluation reserve when she notices that the company has been reducing its depreciation expense every year by adjusting a part of the revaluation reserve against it in the profit & loss statement, which is leading to lower depreciation expense and thereby higher profits. A look at the notes to the accounts under depreciation section of the FY2016 annual report (pg. 135) would indicate that Indo Count Industries Ltd has used about ₹11 cr. (FY2016) and ₹12 cr (FY2015) respectively from the revaluation reserve and reduced its depreciation expense by the same amount. The net impact of the above transaction is that in FY2015 the profit before tax (PBT) becomes higher by about ₹12 cr and in FY2016, the PBT becomes higher by about ₹11 cr when compared to a scenario when the company would not have revalued its diesel generator sets, plant & machinery and building and such revaluation reserve would not have been there. An investor would notice that in FY2010, the total amount of revaluation reserve created by Indo Count Industries Ltd was ₹178.7 cr. An investor would appreciate that the company would adjust this revaluation reserve part by part over the years against depreciation expense, which would effectively increase their profit before tax (PBT) by an equal amount over next few years. The analysis of revaluation reserves section of the FY2016 annual report, shared above, indicates that by FY2016, the company has already utilised about ₹84 cr worth of revaluation reserve and about ₹94 cr worth of revaluation reserve still remains to be adjusted, which would be adjusted in coming years. First, the company revalued its assets upwards and created the revaluation reserve. This exercise increased the amount of shareholder’s equity by the amount of revaluation reserve. This step increased the equity without impacting debt. Therefore, the debt to equity ratio, which is one of the key parameters monitored by external stakeholders declines and the capital structure of the company becomes better. However, when the time comes to recognise the depreciation on the now increased size of assets, the company adjusts the revaluation reserve against depreciation saying that it will provide depreciation only on the actual cost of assets and not the revalued amount. This adjustment of the depreciation expense removes the impact of increase in asset value on the profits. 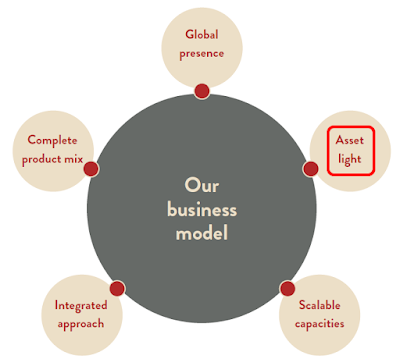 Therefore, the company is able to show lower debt to equity ratio and maintain its profitability as well. It’s a win-win situation for the company on both the aspects of balance sheet as well as P&L account. Therefore, it becomes paramount that the investor should understand the nature of diesel generator sets, plant & machinery and building which increased in value despite usage and the usual wear & tear associated with operational usage. Otherwise, the profits shown by Indo Count Industries Ltd to the extent of ₹178.7 cr at PBT level (equal to the revaluation reserve at FY2010) and related net profits after tax of about ₹125 cr. (deducting 30% tax from PBT of ₹178.7 cr), would not have any sound basis. rejection by a buyer on account of delay in reaching goods to overseas location due to bad sea weather or multiple of other factors like delay in port etc. Therefore, it would seem reasonable to the investor that the revenue should be recognized when the goods are delivered to the buyer and the buyer has accepted the goods with the delivered quality. Such revenue recognition practices leave a higher probability of the goods being rejected by the buyers on receipt by them either due to delay, unacceptable quality etc. and thereby might lead to revenue reversals when such events arise. From an investor’s perspective, the better revenue recognition practice would involve recognition of revenue when the goods are accepted by the buyer at her premises. Other payables of ₹65 cr in FY2016, which is a significantly large amount. Even a one line statement about the nature of items for which these payables are due would have been helpful for investors. Short term loans & advances of ₹51 cr in FY2016, which is a large sum but has been mentioned as “others” in the annual report. It would have helped investors if the company would have disclosed the nature of these advances and the counterparties even very briefly in the annual report. Therefore, the company though has disclosed certain details like debt repayment schedule, which anyway could have been extrapolated by investors, however, it has left out on key aspects like details of a large amount of payables and loans & advances. Providing these details in the annual report would have helped the investors in their analysis of the company. As rightly pointed out by you, the amount of commission being paid by Indo Count Industries Ltd to its founder promoter, Mr. Anil Kumar Jain, is about 5% of net profits, which is higher than the usual norm of about 2% of the net profits being taken by promoter CEOs of many other companies in Indian corporate sector. Moreover, in the current year, the company has brought in the son of the founder promoter, Mr. Mohit Jain, as managing director, whose starting salary for FY2017 is almost at the same level, which was earned by his father for FY2016. It remains to be seen, whether, in FY2017, the total remuneration paid by Indo Count Industries Ltd to the father-son duo would exceed the reasonable levels. Indo Count Industries Ltd is currently available at a P/E ratio of about 11, which does provide a margin of safety in the purchase price as described by Benjamin Graham in his book The Intelligent Investor. Overall, Indo Count Industries Ltd seems to be a company, which has turned around its fortune in last 2-3 years by showing significant sales growth with improving profitability. The company has used the funds generated from operations to reduce debt and do further capital expenditure. Also, the company has been able to achieve the highest asset turnover in the industry, all of which are good signs for investors. However, there are certain aspects, which need to be kept in mind by the investors while doing their analysis and taking final investment decision like usage of warrants by promoters to benefit to the tune of ₹350 cr at the cost of minority shareholders.The investors should also analyze further the revaluation of diesel generator sets, plant & machinery and building done by the company on higher side despite using them for some time and despite normal wear & tear as the revaluation has led the company to show higher profits before tax (PBT) to the tune of ₹84 cr during FY2010-16 and would lead to further PBT of ₹94 cr in coming years. If the basis of revaluation of the above-mentioned assets by the company is not sound, then it would tantamount to inflating profits by using accounting juggleries. These are my views about Indo Count Industries Ltd. However, you should do your own analysis before taking any investment related decision about Indo Count Industries Ltd.
An investor should keep a close watch on the operating efficiency, accumulation of funds by the company in overseas locations and the debt levels of Indo Count Industries Ltd along with its operating margins in future.